As we now have a number of Manx pages on this website, we have provided this index page of Manx gold coins. The Isle of Man is a small island with a population smaller than many small towns, in the Irish Sea equidistant from Ireland, Scotland and England. In fact it is just visible from Blackpool's North Shore at very low tides. It is famous amongst motorcyclists for its historic Manx T.T. races each year, although in 2001 they were cancelled because of foot and mouth disease. Even so, many enthusiasts gathered to ride around the island and its famous street-circuit course. The island has one of the world's oldest parliaments called Tynwald, which enacts its own laws, although this often amounts to ratifying the main British laws as it is a British Crown dependency. It was under Norse influence for many centuries, and has also much Gaelic influence in its culture. Although the Isle of Man has issued its own coins from 1700 to about 1864, after this it ceased to do so until decimalisation in 1970. Since then its coins have been minted by the ubiquitous Pobjoy Mint. In addition to producing real coins for circulation, Pobjoy's successful marketing manages to flood the market with a confusingly large range of denominations and designs in almost every metal imaginable, and manage to do so at very high issue prices. 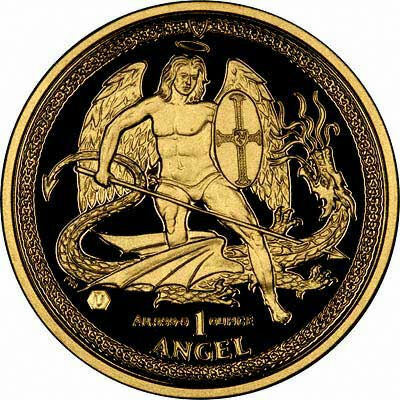 This includes a wide range of gold coins from a gold penny to a gold 25 angel containing 25 ounces of gold, some of these "coins" are only in nine carat gold. At a quick count, we got to 37 different denominations, but we may well have missed a few dozen, it's entirely possible that at least a few more denominations were invented while we were counting! 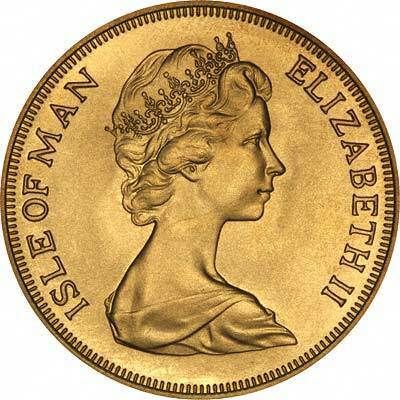 Nevertheless, it is not for us to criticise or choose, we only make a market in them, and there are some of the Manx gold coins which are fairly legitimate such as the sovereigns and half sovereigns, which conform closely to the traditional standards of their mainland United Kingdom equivalents. The gold version of the well-known platinum coin. On this page we list proof and uncirculated manx gold sets. 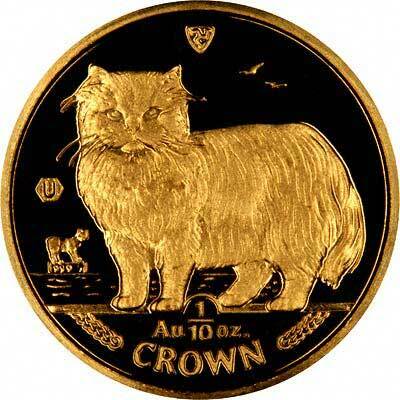 On this page we list individual gold proof commemorative manx coins. Manx gold sovereigns and half sovereigns conform to the same dimensions, weights and purities as their British counterparts. There are some dates which exist in Manx sovereigns which do not exist in British sovereigns. These include 1973, 1975 and 1977. 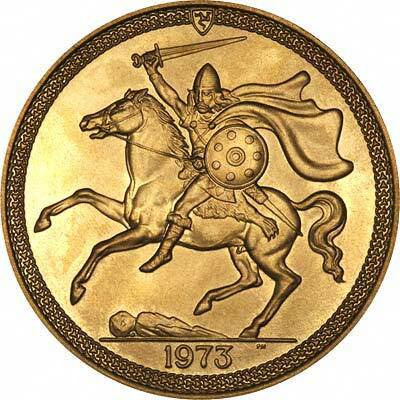 From 1973 to 1982, these have a design very similar to that of a British sovereign or half, in that their reverse design is a Manx or Norse warrior on a horse, which we presume is slaying a dragon after the style of Pistrucci's world renowned St. George & Dragon reverse on British sovereigns, although we could be mistaken, he may be chopping the tail off a Manx cat. For Isle of Man coins in silver or base metal, or Manx coin sets other than gold, please look at the Manx Coins page of our original website.